These comical characters which inspired Disney to create the character Pumba in The Lion King, seem out to amuse with their antics, providing a pleasant diversion during your travels in Namibia. They run with their heads and tails held comically aloft, with piglets in tow. Grazing is done with extreme enthusiasm and vigour, as the warthogs kneel to reach the juiciest shoots of grass their heads bob energetically. One glance reveals where these animals got their name. Four large wart-like lumps occur alongside the eyes and just above their fearsome tusks. These tusks, along with their shovel-shaped snouts, are used to dig out juicy tubers and roots, while the ‘warts’ store fat and protect their faces during the occasional scuffle between males. The upwardly-curving tusks can reach up to 2 ft. long in the case of the upper ones, with the longest lower tusks recorded at six inches. With this armoury, warthogs certainly look like they are fixing for a fight and they can be aggressive when cornered. Their unruly mane of wiry hair and a few sparse hairs dotted about on an otherwise bald, grey body, add to the thuggish appearance. 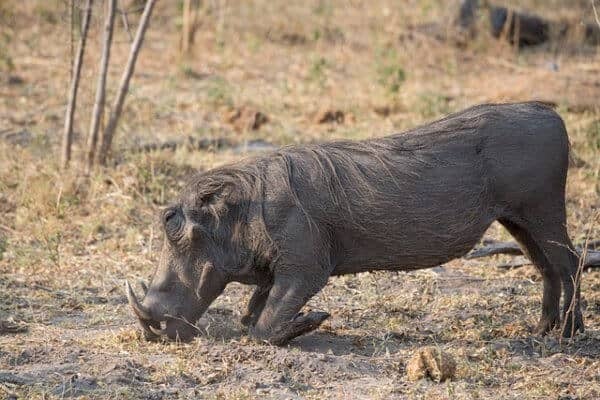 However, warthogs are generally peaceful animals who choose flight over fight any day. The slightest sign of predators in their ‘hood sends them scuttling to their burrows. When your greatest foes are large predatory cats like lions, cheetahs and leopards, this is probably the best defence. Warthogs are not territorial and the males usually keep to themselves outside of mating season. Females and their young stick together for about 2 years, although the piglets are usually weaned by 21 weeks of age. A group of warthogs is called a sounder. This could be due to the vocal nature of the family groups who communicate with a range of noisy grunts, growls, groans, snorts and squeals. Warthogs are often seen transporting oxpecker birds along for the ride. They have a mutually symbiotic relationship with the birds who pick ticks and other unwanted passengers from the animal’s skin. The pigs receive a grooming and the birds get an on board meal and the benefit of an early warning in the event of lurking danger. Warthogs have learned to adapt their grazing habits to suit the kind of threats they face in their environment. In areas where they are hunted by humans, they often hide up in the day and feed at night, while the reverse is true where nocturnal predators roam. This is great news for visitors to Etosha National Park who want to see these animals in the wild during the day time. Here, warthogs are most numerous around Namutoni where there are many waterholes to service their needs. Despite their ability to go without water for several months, they remain close to sources of water if they are available. They are also seen at Ombika near Okaukuejo. Be sure to pay them a visit on your next trip to Namibia.